Today, I worshiped with real Nazarenes for the first time in my life. Today, the day of Resurrection, we took things more slowly. We really only made two stops. 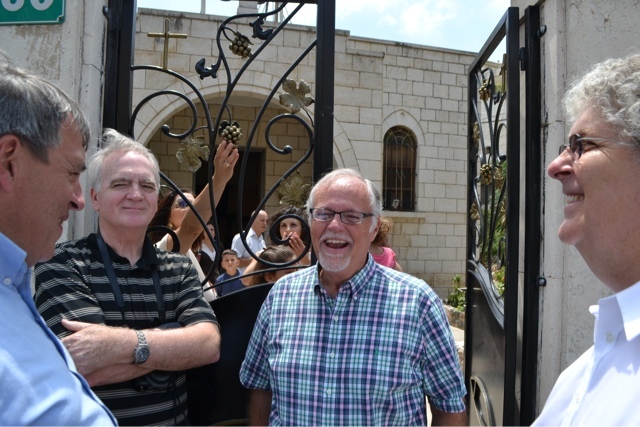 We went back to Nazareth (we went yesterday too and saw the Church of the Annunciation...AMAZING...but that's for another post), driving almost two hours north to worship with the Nazareth Church of the Nazarene. 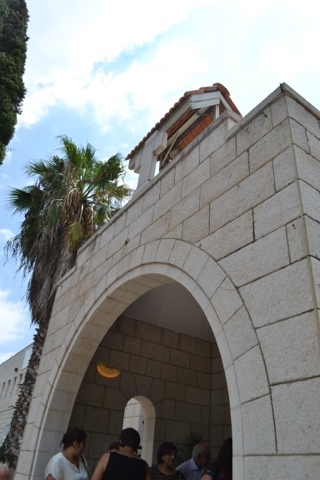 First century Nazareth is where Jesus came from. Now, it can be said that Jesus came from a number of places (born in Bethlehem, raised in Nazareth, lived in Capernaum later in life), but Jesus is from Nazareth kind of like I am from Windham, NH. It was the predominant place of our up-bringing. When a few people began a new church in Los Angeles in the late 1800s including Phineas Bresee and J.P. Widney, they chose the name "Church of the Nazarene". 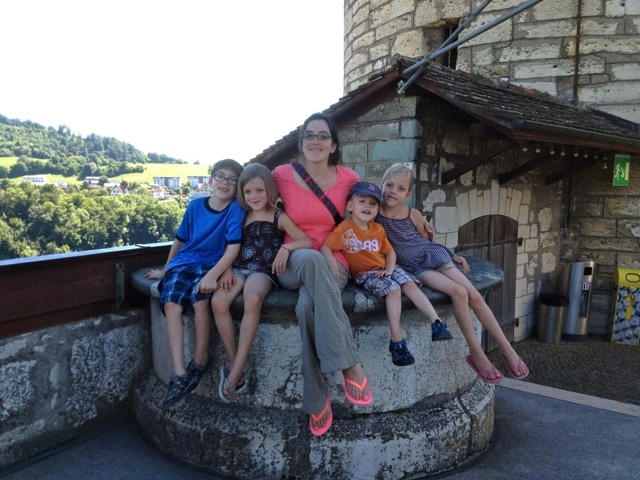 Bresee and Widney wanted this new group of Christians to never forget their calling to the downtrodden and poor. One night, it came to Widney that the fact that Jesus came from Nazareth was not necessarily considered an honorable thing. Nazareth was apparently a rather dingy and sleepy place. In the gospels, when a dude named Nathanael heard that this so-called Messiah (Jesus) was from Nazareth, he replied, "Nazareth? Can anything good come from Nazareth?" So Widney, and subsequently Bresee, wanted the name to reflect the fact that they weren't afraid to minister to and with people from places that others couldn't care less about. The Church of the Nazarene. Anyway...today I truly worshiped with real Nazarenes. 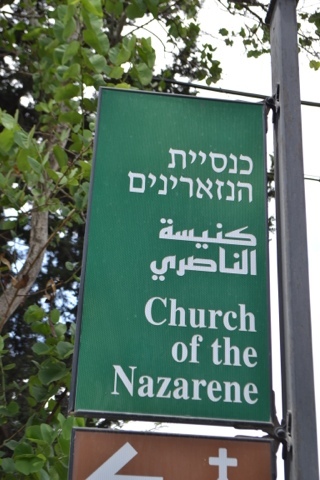 The Church of the Nazarene in Nazareth is an Arabic-speaking church, pastored by Pastor Nazir Touma. Back in the 1980s, Rev. 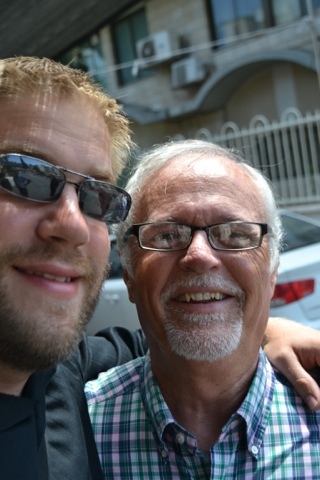 Lindell Browning (an American) pastored the church in Nazareth. 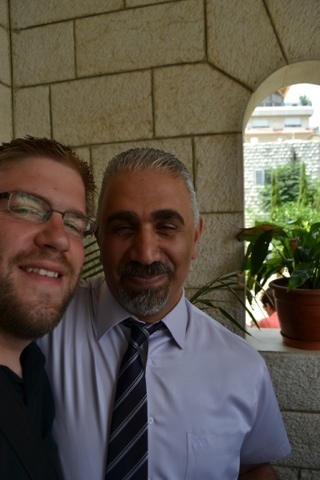 He met Nazir one day when he was pumping his gas. He invited him to a meeting with the church. Nazir resisted, but then came. And that's that. 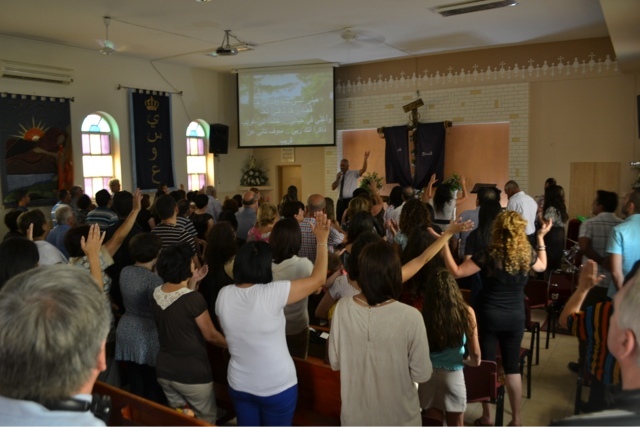 Today, I watched Pastor Nazir lead worship in a packed sanctuary of some 125 people (his wife, Kaity, later said that many people were missing today). We stayed for lunch with them in their home after and talked, laughed, and prayed together. It was great to be with other "members of the Church of the Nazarene" today too. 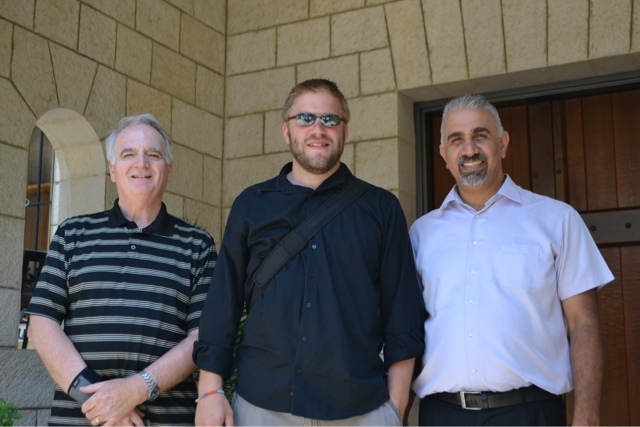 The picture below is of (from left to right): my father, father-in-law (Ron Parker), missionary to the Mid-East and (I think) Mid-East Field Director (Lindell Browning), and MNU Professor (Kelvin St. John). These guys were all in seminary together. 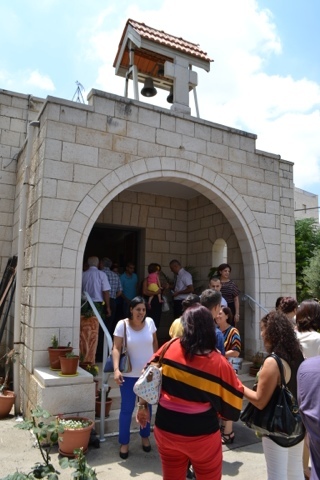 While it is a unique and interesting fact that I worshiped with Nazarenes in Nazareth today, the experience goes beyond the trivial. We all have prejudices because we're human. We remove prejudices by getting to know people. I'm just being honest here. 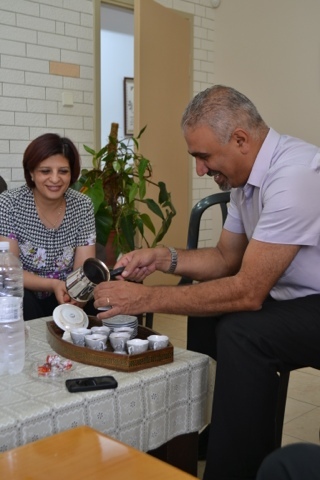 Despite the fact that before I came to the Middle East, I tried to have an open mind, I still have prejudices. Despite the fact that I have tried to mostly ignore the various streams of American populace and media that strive to portray one side or another as the worser one in the whole Palestinian-Israeli conflict (even sometimes assuming that the Palestinians are the victims before even coming here...likely just to play the devil's advocate among those who are in my circles), I still have prejudices. Despite the fact that I know a lot of Middle Eastern-Americans who are wonderful people who love the Lord (I even officiated at the wedding of one of them), I still have prejudices (after all...these have been "purified" by their American experience...). Ugh...see? We have prejudices. So being here, staying in a predominantly Muslim neighborhood, in a hotel run by Arab people, walking to the Old City of Jerusalem through the two gates that lead to the Muslim quarter (Herod & Damascus), well it has been an experience. I have learned with first hand experience now that Middle Eastern Muslims are people. Not just faces on TV and unknown people in a distant land...but people. Humans. Their kids do the same things as mine. I know. I've been watching. And they're incredibly cute. The only thing that has caused fear in the last couple of days are words from the government in the land from which I come. Now I'm not saying that the US government is lying, not at all. Or that they are trying to make us fear (although...it sure seems like the media WANTS something to happen). I would not be surprised if something happens tonight. But if it does, it will not be the fault of the Muslim world, but the fault of a vast minority of the human populace corruptly bent by extreme political persuasions excused by their own understanding of religious belief. Already, CNN (the one site I have looked at tonight - I have no care to look at any more) has used Muslim assumptions to over-generalize. Okay, enough of this. All I was saying is that my prejudices - even though I've tried hard not to have them - have been slowly unfurled by being here. And this morning was so helpful. Now I know I've been generalizing about Muslims, but the fact is that most Americans wouldn't know the difference between "Arab" and "Muslim". I think I have it correct to say now that "Arab" refers to ethnicity while "Muslim" certainly refers to religion. Arabs are from the Arabian Peninsula while Muslims are all over the world (in fact, I think I'd be correct in saying that there are many, many more Muslims outside of the Middle East than in it). 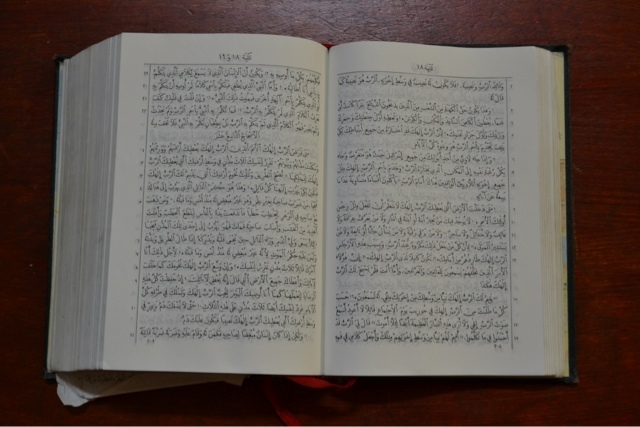 On the way to Nazareth this morning, I mentioned to my father and father-in-law that I wished I could speak and read Arabic. Most all of the road signs over here are in three languages: Hebrew, Arabic, and English (there are exceptions depending on what region we're in). Arabic has generally been an odd and even scary language to me, both in print and out loud. Again, despite my effort to make it otherwise, it just has been. (It's likely true that any foreign language can feel this way, I know). So I'd love to know the language so that when I hear the call to prayer from the minarets or people shouting down my hotel hall, I can understand what they're saying and not assume the worst. So, to worship this morning in Arabic (well, not me, but those around me) and to read scripture this morning in Arabic and to hear a Nazarene missionary speak with an Arab pastor in Arabic today...was great for me. May our prejudices fall apart. 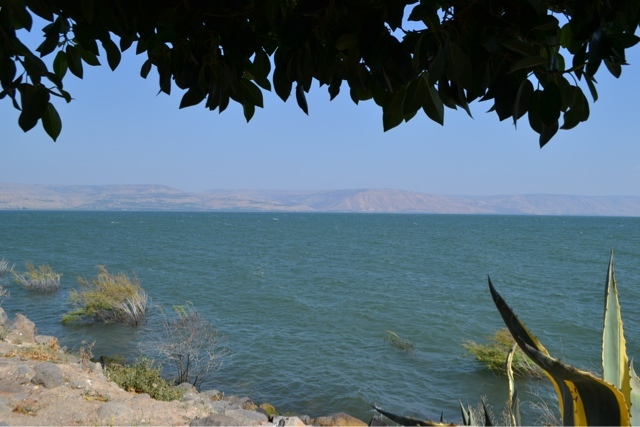 After we departed from Nazareth, we went back to the Sea of Galilee and turned north this time, to go to Capernaum, the ancient town of many stories, miracles, and New Testament characters. Many of the disciples, including Matthew & Peter were from Capernaum. 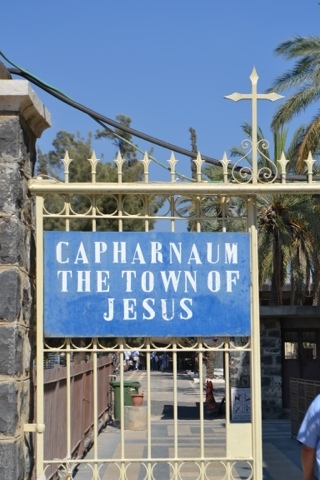 The gospels say that Jesus centered his public ministry in Capernaum and that it was his home. After being there today...I can totally see why he would. 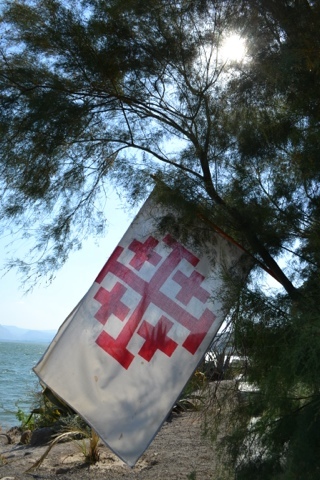 It's right on the Sea of Galilee, which is a rather big freshwater lake. For you New Englanders, it's about the same size as Lake Winnepesaukee. Today, the wind was powerful, creating beautiful white-capped waves. 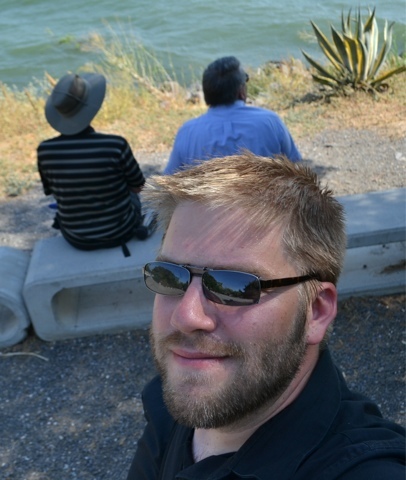 We spent more time in Capernaum than we have at any other spot (other than Masada, but that's kind of a given). I think we were just ready to take something in for a good while. And being the fact that it's Sunday, it seemed appropriate to just sit on the water, watching the waves and birds, and seeing what Jesus actually saw. ...because many of the sites have been less than what one might have expected or anticipated. Please don't get me wrong - being here is incredible and anyone who can have the chance to should come. And I didn't really come with all that many expectations. 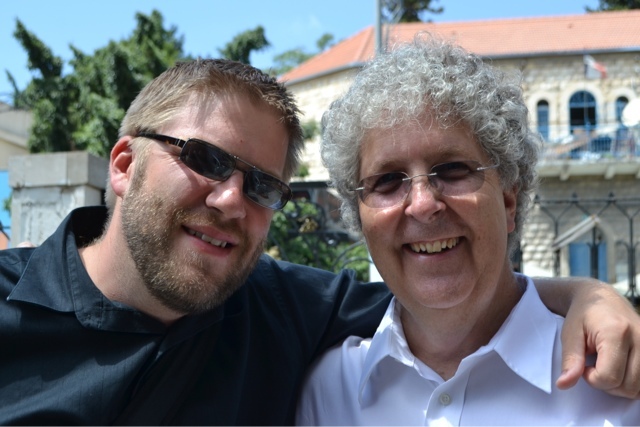 So the inspiration in being here for me has not been like I can hear God better or anything, just that as pilgrimage, these places are revered and venerated both by the stories of scripture and by the history of pilgrimages by millions before me. But the changes over 2000 years are enough to make a literalist like me note that it is nothing "like it was." 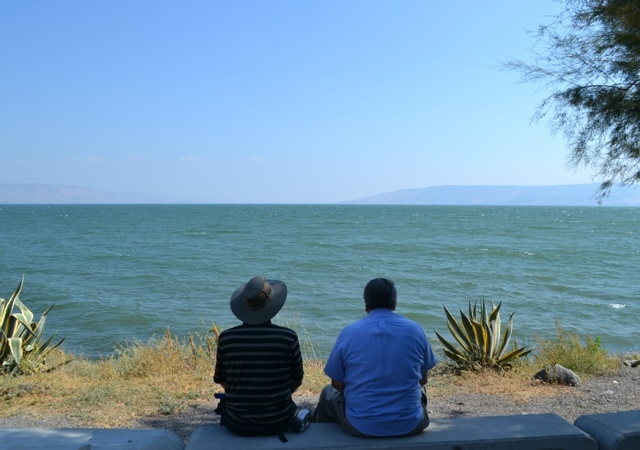 The Sea of Galilee, however...those waves were rolling like Jesus must have seen them, and experienced them, and loved them. While there were some ascetic moves in Jesus' life (wilderness time and prayer on the mountains, etc. ), his move to Capernaum was not among them. It's beautiful. And it was a fishing village. On the water. 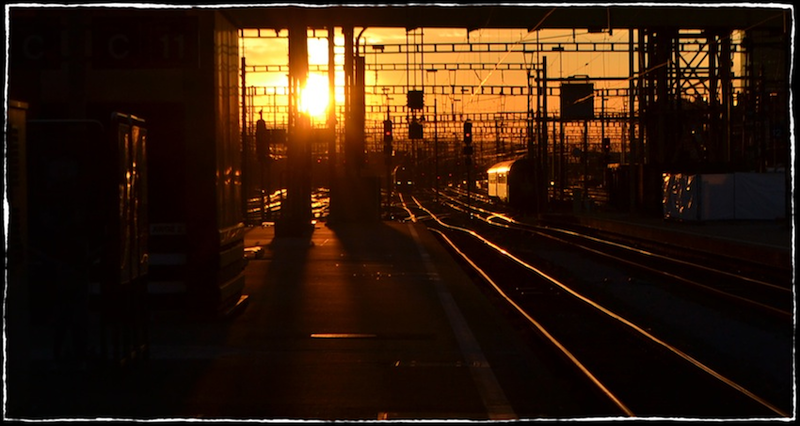 With sunrises over to the left and sunsets over to the right. Both over huge, beautiful mountains. A totally livable area. One of the surprises to me here in Israel has been the weather. I expected mostly dry, desert heat. 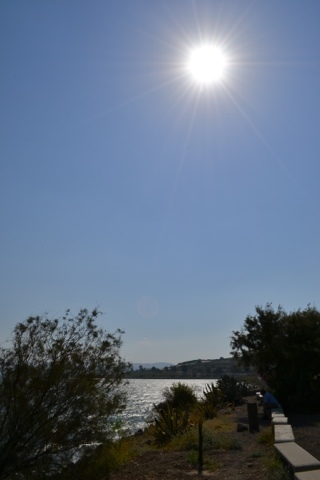 And while it has been very hot at some points (late in the day at Masada), it has been very pleasant much of the time we've been here, and we are supposedly here in the hottest time of the year. The mountains we've driven through (and we've driven a lot of territory, we passed over 1000 total kilometers today) have been beautiful. There are mountains that are mostly rock like all the Jesus movies you've seen might imply, and there are dry vegetative mountains not unlike those in the desert of Southern California that I saw two weeks ago. 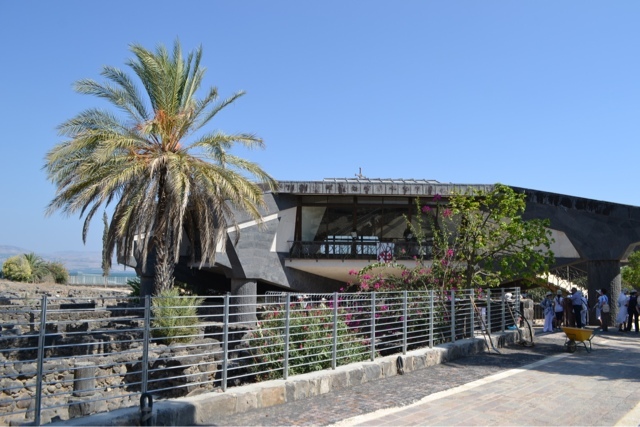 But most of the mountains are very beautiful, particularly around the Sea of Galilee. Jesus picked a good home. 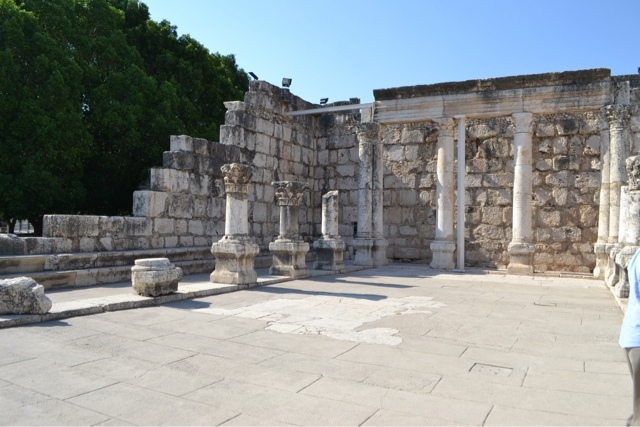 There is a monastery and church building built right among the ruins at Capernaum. It was a small town 2000 years ago, scholars guessing somewhere around 1500 people. So the ruins are that extensive. But the church was one of my favorites that I've seen. 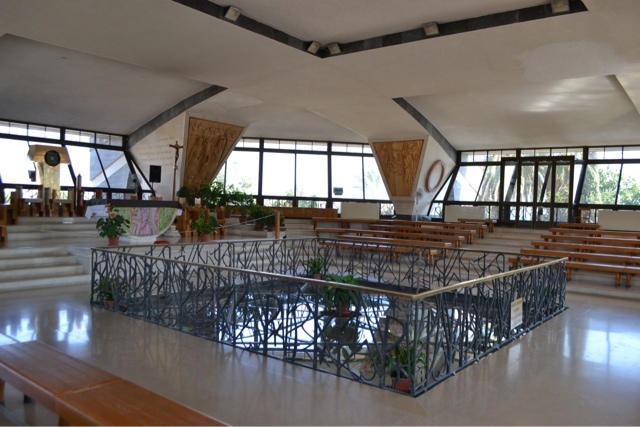 It's a very modern-looking Catholic Church, octagonal in shape, built over an ancient church (4th century) of the same size, which was built over the traditional site of Peter's house. 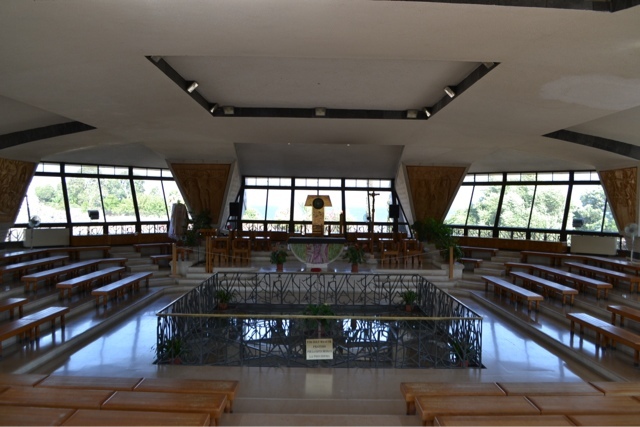 I could totally worship in this sanctuary. We also saw the ruins of a synagogue that some experts think was built on top of another synagogue in the 4th century as well. So the first one would have been Jesus'. It was kind of like seeing where his own local church was for me. We drove back and are back in our hotel room. We barely thought about the terror threat today, and the return to our room was pretty much the only reminder that we're supposed to be afraid. We even kind of laughed about it with Revs. Browning and Touma. We should take terror seriously, but we need not let it cause us to fear. Two thousand years ago there was an oppressive regime with way more power than Al Qaeda called the Roman Empire who used two pieces of wood strung across one another to cause fear all over the land. These things may hold us down for a little while, but we cannot live in fear. Otherwise we're not really winning. The terrorists are. That's why they're called terrorists. We cannot live in fear. The Lord has shown us that in the end, life wins. Love wins. It's not about strength-power over-coming strength-power, but about love through submission overcoming strength-power. For the Christian, there is no other way. We have one more full day in Israel.